Have you ever attended an Absentee Bridal Shower Theme party? This is a celebration of family and friends, without the bride or couple actually attending in person. With couples on the go, and families scattered, this type of party is becoming more common. So, how do you host an event like this? You would make plans similar to other showers. You can decide to go "all out" or keep it simple. The big difference is you will schedule a remote "appearance" by the bride or couple, if possible. • Your invitations will let everyone know your theme. You can use the bride's colors, a personalized theme, or even the state where the couple will reside. 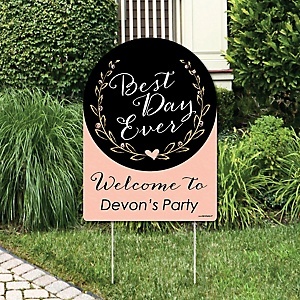 The important thing is to let guests know that this is an absentee bridal shower. It will be a new concept to most. *** Now is also the time to relate the handling of gifts. Please see suggestions below under gifts category. • Choose decorations to go along with your theme. Just because the bride isn't attending, doesn't mean your decor has to be dull. If she or they like to travel, do a travel theme. If they are health nuts, have a spa theme. Do they really need all the basics? Have a kitchen and bath party. You'll want to plan activities for your guests. Sometime during the party, visit with the bride or couple. This can be done on the phone, or through the magic of the internet. Depending on the circumstances, this isn't always possible. You may also have someone tape the party, and send it to the couple. • Choose some games for your absentee bridal shower theme. Word scramble and bingo are always popular. There are other games that relate specifically to holidays and seasons. This is just another idea to consider. • Another "activity" is to have guests bring their gifts unwrapped. Take pictures of each guest with their gift. These photos will be assembled into a keepsake album, and given to the bride. 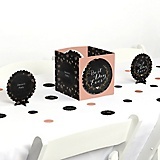 The hostess sets up an area with gift wrap and supplies where guests can wrap their gifts. Afterwards, the presents are combined and sent by the hostess to the bride. • Music can be for dancing, singing, or just enjoyment. Choose favorites of the couple and/or tunes that go along with the type of event you've planned. If you let guests bring their gifts and wrap them at the party (one of the activity ideas listed above), you can pack them together, in as many boxes as needed. Combing this way, will lower the cost of sending the items. •These personalized pillowcases are a great gift idea. • Have each guest send their own gift. • Host a gift certificate party. • Favors are optional. They are always a nice way to remember a celebration. If you decide to give them, coordinate with whatever theme you've chosen. • Plan your food as you would for any other party. You can choose anything from cake and coffee, to a full course meal. It's up to you, and your budget! Veggies and dip, tea sandwiches, and dessert platters, are always good options. • Choose a punch recipe that complements your menu. • Do you need some theme ideas? • Go from absentee bridal shower theme, to Bridal Shower Ideas For You homepage.